I hate grading. Like really hate it. I hate piles of paper. I hate assigning grades to students. I hate measuring how good they are at Spanish. It seems so pointless. We all learned out first language without any grades attached and it really chaps my hide that grades are a part of our system. But…if I want to keep my sweet gig at my sweet school with my sweet students, I better grade them. So, since we revamped our grading philosophy this year, I’m taking a long hard look at the assessments I make, the grades I give and the information that’s communicated by their grade. And I’m looking to simplify every way I can! Because ain’t no teacher got extra time just languishing about! I’ve been using my magic cards for years but this year I made some significant changes and I must say, they are new and improved! So much so, they deserve their own post, so read on, dear reader. Enough chit chat, let’s get to business. Basic idea: There’s an index card dedicated to each kid. The teacher uses the cards to randomly call on students AND to evaluate their listening, speaking and reading skills on the spot. Zero time spent grading papers. Tell me more! To prep: Pass out an index card to every student. I strongly suggest you buy colored index cards and assign one color to each class so that if you drop the entire stack, it’s easy to sort the classes…it happens! I like bigger ones so there’s plenty of room for data. And man, do administrators love data! And you need a way to organize them: coupon organizers work great! I got mine at the Dollar Tree like 11 years ago but if you’re the click and shop type, Amazon’s got you covered! Instruct your kiddos to write their name on the top of the card, and in the top left corner write S and circle it. In the top right, write L and circle it and on the bottom left write R and circle it. Then they students pass the cards in. That’s practically zero prep…and you saved yourself like 2 hours of writing them all yourself. So, since you just saved yourself all that time, go take a nap. You deserve it. A = Excellently responding or translating perfectly or nearly perfectly. B = Almost! Pretty good! They needed a bit of help, but they got there. C = Not quite, not really, needed more help to get there or didn’t understand/ couldn’t translate but tried, got part of it. D = I haven’t given any D’s yet…I mean, they have to be really off in left field…but I suppose if you want to give a D for a kiddo who is showing that they really don’t understand, have no clue, and not comprehending anything you say, yep, that would be a D.
X= When you call on a kid and they’re off in La La Land… and they need to hear the question again. I don’t factor this into their grade, but I do like to keep track of how many times I called a kid and they we not with us. After I repeat the question, they earn their letter score next to the X. Then, every 6 weeks (because our report cards go out every 6 weeks!) enter the grades into the grade book. I enter 3 separate grades: Oral Participation Grade, Listening Participation Grade and Reading Participation Grade. I make it worth 10 points and just eyeball it. If they’ve got all As- I give them 9.5 or 10. If they’ve got mostly A’s and a B, it’s a 9.2, all Bs is a 8.5, Mostly Bs with a C is a 8 or so… It’s not very scientific. Just look at their grades for that skill and give them the average. Then draw a line below it and start again for the next grading period. Note: these are not the ONLY grades they get in the grade book! They’ve also got some listening and reading quizzes and some quick writes too! Here are some examples below….see the lines? That’s dividing the 1st 6 week grading period from the 2nd grading period. This kiddo below hasn’t been assessed in listening yet this grading period… I’ll be sure to pull his card up sometime before grades are due again. So what kinds of things are they doing to demonstrate these skills? Speaking Participation Grades I don’t think it’s fair for my brand new Spanish 1 babies to have speaking grades at the beginning of the year! 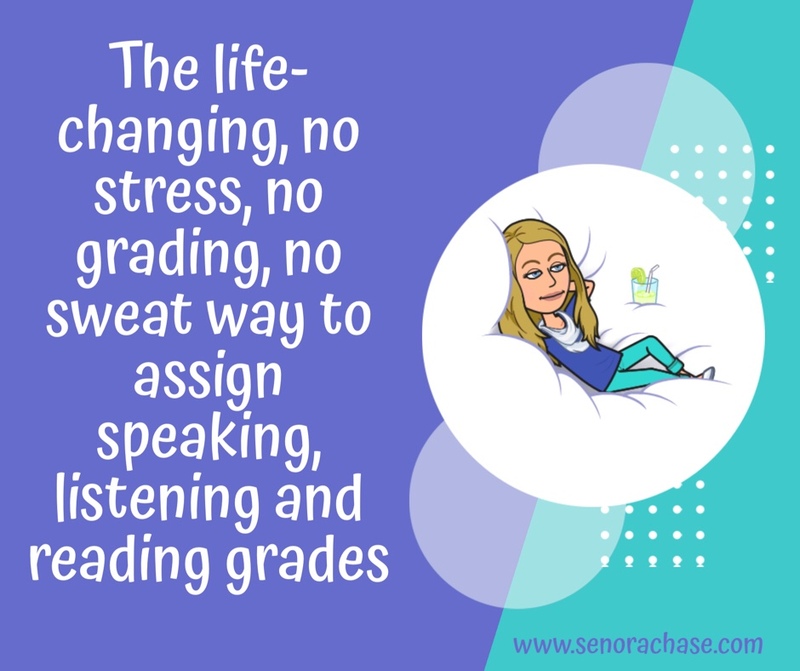 But since we decided as a department that we would give Speaking, Listening, Reading and Writing grades…I needed a way to assess their speaking in a low stress way. In my 1’s, we’ve been doing the basic questions and I ask a few questions every class: ¿Cómo estás? ¿Cómo te llamas? ¿Cuándo es tu cumpleaños? ¿Qué tiempo hace? And then give them TWO grades, one for listening (did they understand my question) and another for responding. Easy peasy and low stress! We do this so often that kids don’t even bat an eye, they’re used to it and it doesn’t stress them out. No more speaking tests in Level 1! Hallelujah!!! Use them during story telling. Use them to talk about their weekends. Use them for shooting the breeze. Listening Participation Grades: In addition to the listening grades mentioned above, I use them for quick translations. During story listening or story telling or Special Person Interviews or when I’m just chatting with the class, I’ll pull a card and ask “What are we talking about?” or “What did we just learn about…” They respond in English and they get a listening grade. Who knew grading could be so easy! Reading Participation Grades: When we’re reading a story together on the screen (maybe after we just Wrote and Discussed something) I’ll ask them to read and translate with their partner, then I’ll call cards and ask them to translate a sentence. Give them a quick grade, then ask the next kid to translate the next sentence. (I like to give them the chance to work it though with their buddy first and have the chance to ask about any unfamiliar words first before I call for the grade). I also use these cards to ask kids about the novel they’re reading when we debrief after Free Reading I ask them about their books and give them a grade based on how well they’re understanding what they’re reading. In my level 4 class I give them the option: they can answer in English for a Reading Grade or they can answer in Spanish and earn Reading AND Speaking grades. A few final thoughts and a confession: Shhhhhhh! I don’t really draw the cards randomly…as I’m asking questions I’m shuffling and looking at the cards. I’m looking to see who doesn’t have a Speaking grade (or Reading or whatever we’re doing) and I’m thinking about a question that I’m pretty sure that kid can get an A on. (Hey, that’s differentiation! And I don’t like to embarrass my little darlings… I want them to feel like Spanish Rock Stars!) And if I don’t have a grade for a particular skill for that kid during the 6 week grading period, no problem. I just exempt that grade and make sure I call on him more in the next 6 weeks. 1. So the kids always have their cards out and you walk up and write down the grade on the spot, yes? 2. So, say, all your students end up with As and Bs because you are differentiating and scaffolding your speaking and their reading to their level. Do you indicate the students’ proficiency level in the notes of the report card say, and if so, how are you judging/assessing that – on other assessments that do not get tracked on the card? 3. And forgive me if I have asked you this before, but does your department give Honors credit at any levels, and if so have you tied placement and grading to proficiency levels (since grades would not be indicative of language ability since we are differentiating and scaffolding). Thank you for all the time you take to share with us! Sorry, in #3 by “grading” I mean that the differentiating continues and Honors students need to keep growing using their beginning of year proficiency level as a benchmark. Hi Laura, 1. They don’t have the card, I keep them all. I just pass the blank ones once to have them write their names. Then I collect them and keep them in my coupon holder. 2.No, I don’t differentiate their level on their card but I keep in mind that an A shows they exceed the proficiency level set by our state, a B meets it and a C approaches the level. Since it’s an informal assessment and not worth as much as a test, I don’t stress too much about aligning it. 3. Nope, no honors classes here! Thank you! I teach at a small independent school where we have Spanish for 2-year olds through 12th grade. So we have kids who are Intermediate-Low, Mid and maybe High proficiency levels by the time they reach Spanish I in 8th grade, who are mixed with students that transfer in who have never had a day. This year, these higher proficiency students are receiving honors credit based on a pretest. By default, these Honor students would earn As all year long if I measured them against a Novice-Mid (1st sem) or Novice-High (eoy) benchmark. My thought was to adopt the Input Expectation Form which grades them on their attention, level of engagement, blurting control and their being a good citizen by not distracting neighbors from their input, which is all any student can control vs. their processing speed. This would be their grade in the grade book. How does your school address when there is such a range of proficiency in one class? Do you think Honors is fair, and if now what would be another way to address my situation? Love love love this!!! I’m interested in knowing how you set up your grade book!? We are supposed to do 70% summative and 30% formative… does that sound right? And to use this as formative? Yes, I think this would be an easy way to add formative grades! I might work toward incorporating this in my classes since I hadn’t come up with a way to assign grades to my informal speaking yet. I *used to* keep questions for each unit in leftover plastic Easter eggs. The eggs were (theoretically) color coded by difficulty and unit. So not only could I pull a lower proficiency question for a lower student (without drawing attention to it) I didn’t have to think up questions on the spot! It also meant that I could pull “review” questions periodically throughout the semester/year. More recently we’ve been doing “circles” every other week. We take a question of the day (or 3, since some of my classes are large and the same question and answer gets BORING) and takes turns going around the circle. Sometimes we go in order, and sometimes we throw a pelota across the circle to make things interesting. To keep students listening, they aren’t supposed to repeat the same answer as the person before them. So, if the question is ¿Qué te gusta? two students in a row can’t answer “Me gusta la pizza.” They can use another cognate, but they have to listen to each other. A few weeks ago, since no one was going to sit through 34 versions of “Me llamo…” we did ¿Cómo te llamas? ¿Cómo estás? and ¿Cómo se escribe tu nombre? and tossed around a foam dado instead of a pelota. I think maybe combining those two ideas with those handy-dandy cards of yours might just be the ticket to increasing the number of informal grades I have in the gradebook. (I also detest giving grades! And unfortunately half of my department liiiiives to grade every scrap of paper. Ugh!) ¡Gracias! Oh Lordy!! No need to grade everything!!!! The color coded Easter egg questions sounds like a cool idea!! Thanks for the idea! I just made these cards. I punched a hole through the bottom right corner and put them on a metal ring. Now I won’t lose any! They are alphabetical. Thanks again. That’s a great idea! I’m afraid my 12 year old coupon holder is on it’s last legs…when it dies, I’ll use your Binder Ring trick! I LOVED stumbling upon your Magic Cards post at the beginning of this school year, and now I LOVE this strategy even more! I didn’t think it could get better, but it did! Merci!!! How many letter grade/checks might be on a typical card prior to reporting? I have more on my Spanish 1s than for my Spanish 4s…we report grades every 6 weeks and most kids have 2-3 per skill, per grading period. But if I have a kid without a grade (maybe they were absent a lot), I just excuse it for that grading period. Thanks so much for sharing your ideas. I’m trying to picture this though and wondering how this actually works b/c I find I’m always using my hands to gesture or write something on the board and can’t picture myself holding onto cards all the time….are you constantly picking up and placing down the stack of cards through the whole hour? Do some kids feel more on edge b/c they constantly see you writing something down or do you just do this once in a while? I can see some of my kids wanting to know immediately what score I gave them…do you get that? on my computer cart at the front of the room when I need my hands, then pick them up for comprehension checks. So like, during a Movie Talk, for example, they’re on my cart while I’m pausing the video and talking about it. I’m asking questions, kids are volunteering answers, maybe we’re trying to figure out how old the character is… I’ll take three or four suggestions, then pick up a card, call a kid and that kid will give us the final answer. Then we move on and I set them down… then we’re reviewing and I pick them back up to check some listening comprehension. Does that make it easier to visualize? I don’t use them every moment of every class— there’s still a lot of me chatting with them and students spontaneously responding. I haven’t sensed that they “on edge” but I definitely feel they’re more focused when I’m using them. I explain to kids how they get their grades and they know that all grades can be “redone” if the student doesn’t feel it’s an accurate reflection of their proficiency level. Kids can see me after class to check their card grades (although no one ever has!) but I think by making them really “low stakes”, it lowers the stress factor. Also I’m intentional about asking kids a question that I’m pretty sure they can answer, so the card doesn’t feel like a “gotcha”. Also, they frequently get a “practice round” before I use the cards. If I have a story written on the board, I’ll have them translate with a partner, then call kids to translate sentence by sentence for a reading grade or they’re practice a retell with their partner before I use the cards. Yes, thank you! I appreciate the clarification that there are still times when you are chatting and they are talking spontaneously without you logging every single comment – it was just not sounding stress free at all to me but I can better visualize it now. Thanks for clarifying!